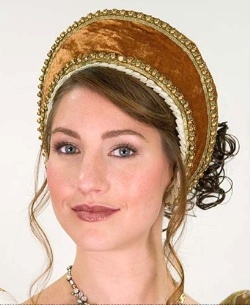 A crowning touch for your Tudor period gown! The elegant and simple Tudor styling will compliment many of the renaissance dresses in our collection or your own period ensemble. Constructed with a stiff interior frame and covered in luxurious cotton velvet with white edging and gold trim. This one size fits most French Hood is available in your choice of black, burgundy, dark blue, or gold.